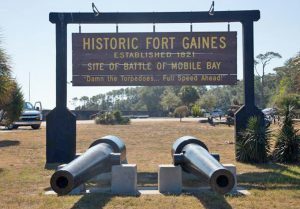 Mobile Bay is home to two historical and iconic landmarks: Fort Gaines and Fort Morgan. Take a day to explore them both! You may have heard the phrase “Damn the torpedoes – full speed ahead!” That was the infamous order given by Admiral Farragut at Fort Gaines during the Battle of Mobile Bay. Fort Gaines has been preserved for more than 150 years, but due to its location, was recently designated as one of the Eleven Most Endangered Historic Sites in America. 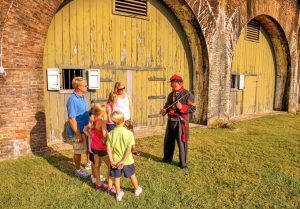 Explore the fort any day of the week, or schedule a guided tour for your group of 15 or more. A short ferry ride across the bay from Fort Gaines sits Fort Morgan. During the Civil War, Fort Morgan provided a safe haven for blockade runners bringing supplies to the Confederacy. This ended in 1864 when an overwhelming 24-hour artillery bombardment compelled a surrender at the fort. After the Civil War, Fort Morgan became active several more times – once as a site for President Franklin Roosevelt’s Works Projects Administration and again during WWII. In 1946, the War Department deeded Fort Morgan Military Reservation to the State of Alabama to use as a historical park. Today, visitors tour the well-preserved structure, picnic on the grounds, and browse the museum and gift shop. For information on admission fees, location and hours of operation, visit the Fort Morgan or Fort Gaines websites. These two forts are certainly worth exploring!